A KINGSCLIFF hedge fund whose troubles have enveloped some of the nation's biggest sport stars has been wound up and placed into liquidation. As revealed by the Gold Coast Bulletin last month, Goldsky Global Access Fund and its owner Kenneth Charles Grace, 53, had their assets frozen by the Supreme Court as they battled civil fraud charges overseas and allegations of financial misconduct in Australia. In the court application to freeze the assets, ASIC alleged Goldsky operated without a financial services licence, operated an unregistered managed investment scheme called 'Goldsky Global Access Fund' that has raised more than $16 million from more than 50 investors. The regulator also obtained freezing orders for assets owned by Mr Grace's wife Jane. Liquidator Chris Baskerville of Jirsch Sutherland was appointed to three Goldsky companies at a meeting late last week. ASIC said it would allege Mr Grace used investor funds for his own personal use, including substantial payments to family members and the purchase of personal items. Documents lodged in the freezing order case alleged former royal nanny turned Gold Coast wedding celebrant Kate Turner was one of more than 50 investors, including Olympic swimmer Sam Riley, cyclist Robbie McEwen and former Brisbane Lions captain Simon Black, to have paid $16 million to the fund. ASIC told the court it suspected Goldsky was a Ponzi scheme and that there were dozens of suspicious transactions valued at $1 million in Goldsky's accounts, including $747,646 likely transferred to Grace's family members, and about $300,000 allegedly spent on jewellery and watches, cosmetic surgery, clothing, restaurant meals and beauty treatments. There is no allegation of misconduct against Grace's family members. The United States Securities and Exchange Commission (SEC) filed a civil suit in the United States District Court, Southern District of New York against Goldsky Asset Management LLC and Mr Grace on September 27. The SEC's complaint alleges Goldsky's claims about managing $100 million of assets and about it returns were "false and misleading". 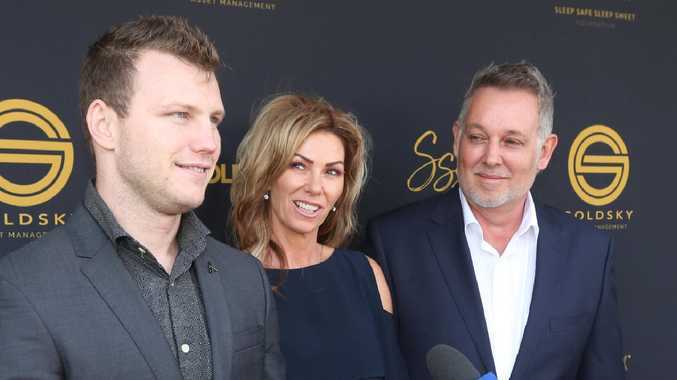 Queensland boxing idol Jeff Horn joined world champion surfer Joel Parkinson and Olympic cyclists Robbie McEwen and Stuart O'Grady to launch Goldsky's Sleep Safe Sleep Sweet homeless charity at a lunch last August. The athletes said the event was a paid appearance and they have no ongoing relationship with the firm or its charity.